First Security Bank is a local, family owned bank that is a proud supporter in helping customers achieve financial success and freedom. We are passionate about the community in which we live and work and strive to pay it forward and make a positive impact to better the lives of others. We are thankful for our talented staff and customers who allow us to assist them in their financial journey. It is truly a pleasure working with you! Beginning in 2016, we began awarding the Byron School District "Impact Fund," an annual donation of $15,000 to use for implementation within the Byron School District. This donation helps to avoid programs being cut and to cover the cost for necessary items that would impact many students for years to come. Each year, during the December Holiday season, FSB sets up a tree in which local community members are given the chance to "adopt" a local family or individual and provide gifts or items they would otherwise not be able to receive. We have helped students reach their goal of higher education by awarding over $200,000 in scholarships to more than 100 area students. Annually, FSB hosts a "collection drive" where we collect necessary items for the Ronald McDonald House in Rochester. We then serve a dinner to the families there. We have sponsored and supported Make-A-Wish of MN children and their families. This organization grants wishes to MN children with life threatening illnesses. FSB hosts a party for BrrrFest Celebration in Byron where we provide snacks and complimentary face painting for the community. FSB is a registered Operation Kindness drop off location. This is for people to drop off their leftover Halloween candy and we mail it to the troops serving overseas. Interested in participating in one of our charities/fundraisers? Contact us today to find out how you can give back to the Byron community. First Security Bank and the Byron School District have had an ongoing partnership for many years. In an effort to support innovative school initiatives that support student learning in a time of limited school resources, a framework for ongoing support has been created. 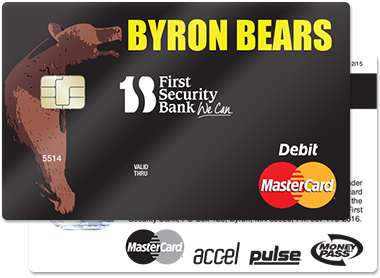 For these reasons, in partnership with the Byron School District, First Security Bank created the Byron Bear Debit Card earmarking a portion of the proceeds earned from the use of this card back to our area youth. Every time the cards are used to make a point of sale purchase, First Security Bank donates a percentage of the interchange fee back to the Byron Public Schools. The cards provide funds for programs and supplies that may otherwise not be possible. We encourage you to use the card that gives back! The main focus of these funds is to impact the greatest number of students in the Byron Public School District as possible with monetary gifts that will benefit students for years to come. It is also our goal to award money for items that would not be funded through the normal course of business without a fundraising campaign. This one time contribution is not meant to be used towards reoccurring expenses from year to year. All funding requests should be linked to the Byron Public School Strategic Plan and focus on enhancing or improving student learning. Money raised through this interchange system will be available two times per year with funding applications due by March 31st and September 30th of each year. Donation Requests will be reviewed and selected by a committee made up of First Security Bank of Byron employees in conjunction with Byron Public School officials in April and October of each year. Checks will be issued by May and November. A brief report summarizing outcomes and impact of the donated funds would be appreciated shortly after the ending date of the project. Project pictures are encouraged, and we request they be submitted with your summary report. Applications may be submitted beginning Fall of 2016 by a Byron School District Staff Member. Look for more info to come in the Fall of 2016.